We are always stressing how important proper hydration is to the health of your dog. Unfortunately, making sure your dog get enough water is even more difficult this time of year as the weather warms, the sun shines bright, and they begin spending more and more time outside. 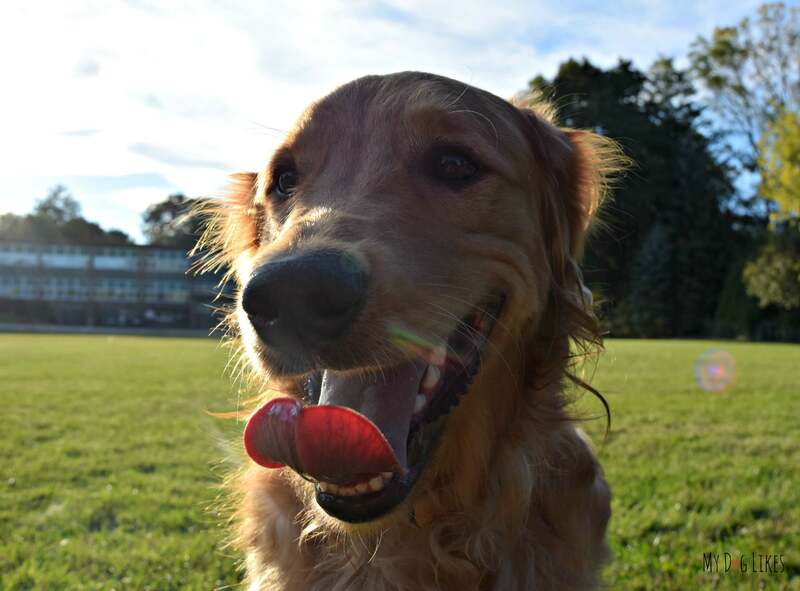 So what do you do when your dog is spending time in the yard? Well most likely, you simply set out a bowl for them to enjoy at their leisure. 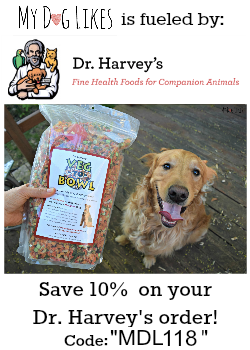 The bowl must be constantly refilled – If your dog will be outdoors for an extended period of time, you need to constantly check in on the level of their bowl to make sure that they have enough. The water gets warm – Even if you have a nice shaded spot for their bowl, it will get warm relatively quickly in the Summer heat. Who wants to drink warm water?! The water gets dirty – Let’s face it, our dogs are not exactly neat and tidy. Between digging in the dirt and chewing on sticks, they are sure to leave plenty of debris behind in their water bowl. That is not even mentioning whatever leaves, seeds, or pollen is falling from the sky on its own! 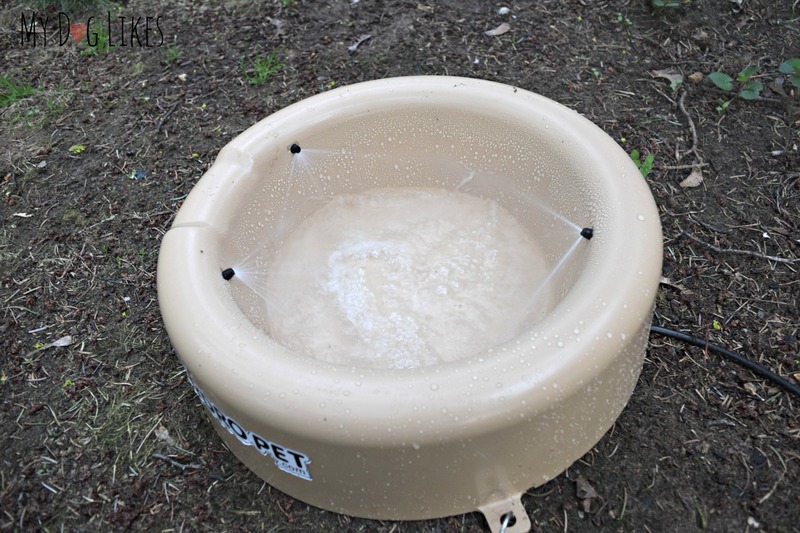 Thankfully, we were just introduced to a new pet watering system that solves all of these issues and more – and they are sponsoring this post to help spread the word about their awesome product! 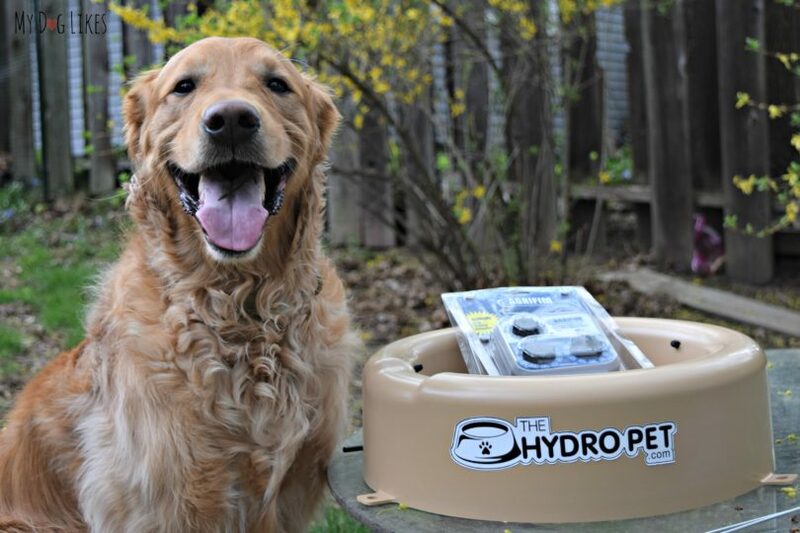 The Hydro Pet is an automatically refilling outdoor water bowl which makes sure that your dog has access to clean, fresh water at all times. That’s not all however… the system also purges warm or dirty water as a means to irrigate nearby flowers or plants. 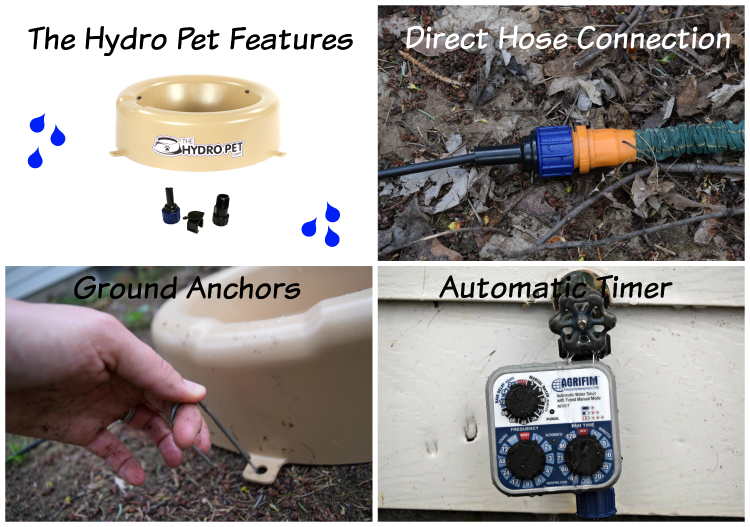 The Hydro Pet system attaches to your homes current water supply and utilizes a timing device and system of water jets to fill your dogs bowl at preset intervals. Meanwhile, old and dirty water is discarded via a built-in waterfall and recycled to neighboring foliage. Keeps the water cool – Still water sitting outdoors will heat up in no time. The Hydro Pet will refresh your dogs bowl often enough to keep the water at a pleasant drinking temperature. Keeps the water clean – Aside from the visible debris, algae and insect larvae can also settle in your dogs bowl. The continuous purging washes this nastiness away and helps to assure that your dog isn’t ingesting anything that could make them sick. We have only a standard hose spigot on our house, so installation was really simple. The tube to hose adapter fitting will get your Hydro Pet connected to your water line, and you are good to go. If you purchased the deluxe version (with automatic timer) you will want to put this in-line as well. This handy contraption takes care of filling the bowl at preset intervals so you don’t have to! Now, place your Hydro Pet Bowl in a place where you don’t mind your dogs walking, and where you have some plants or ground that could use a bit of extra water! Water enters the Hydro Pet via 3 jets which are strong enough to fill the bowl quickly, but were not violent enough to startle our dogs. Both boys walked right over to check it out right away! We love that the Hydro Pet has a large capacity, with plenty of room for multiple dogs to drink simultaneously. The waterfall area works exactly as intended and we are excited about the prospect of recycling any water that is not ingested into our flower bed! This is particularly important for the more drought prone areas of the country where water use most be closely regulated. We love anything that can make a pet parents life easier, and the Hydro Pet takes one more thing of your plate. This genius device makes sure that your dog has access to water at all times – and not just any water…but fresh, cold water. This is hugely important for both your dog’s health and general safety. We are super excited to have this in our yard for Summertime BBQ’s and get-together’s!! Want to try a Hydro Pet for yourself? Thanks, Kevin and My Dog Likes! We’re glad you love the bowl! This would be great for my mutt. Sure would, Ginny! And it would be great for you, too- it saves owners a ton of time that they’d usually spend cleaning and refilling their pups’ bowl! my favorite feature is that it is BPA-free. i have 3 gals, so i am always filling up the water bowl. Sounds like The HydroPet would save you a lot of time, Sandy! Don’t forget to enter the free giveaway contest, or follow the link and get your own! We love that it’s BPA-free, too. Wouldn’t want our furry friends drinking out of anything unsafe! I like that it is self refilling. I love that this allows for multiple dogs to drink. One of ours is constantly knocking the other out of the way. I love this- Zack has a huge water bowl inside but runs out quickly- this would be perfect to be sure he always has fresh water. This would be great because it’s a large bowl. We always bring a bowl outside when we hang out in the pool and the dogs are running around the yard so this being refillable is great. I like that it automatically refills with fresh water. I love the Hydro Pet via 3 jets filling the bowl. Also great recycling and reusing. You can never go wrong with that. I like that it keeps refilling itself and the extra water goes to your nearby plants. I like that it’s BPA-free. My favorite feature is that it is secure and cant be knocked over. Bending over and refilling my dogs water bowl is really difficult for me with my bad back. This is a life saver!! My favorite feature is that it’s secure and cannot be tipped over.. My boys always manage to knock over the water bowl.. This would be amazing in every way. Our air in Utah is so dry, this would give my babies fresh water when I’m not thinking about it. Not that I don’t constantly check in the summer….it would be SO nice not to have to do that!! I like that it keeps refilling because we live in the desert area and it is an important feature. Our dog is old and drinks lots and lots of water so this genius device makes sure that your dog has access to water at all times is the feature I like. My favorite feature is that it gets rid of warm, crappy water and replaces with fresh water. That’s important out here in the AZ desert. Always wanted one od these its so important to keep my girls watered love them.. I like that it is large enough for multiple dogs. This bowl looks really great for the summertime. Ground stakes to keep my Jesse from carrying it off! I love that the water gets replenished consistently. I love that it is self-refilling. Our 2 dogs can empty a bowl as fast as I fill it sometimes. I know they would love this. I love that it is BPA free. 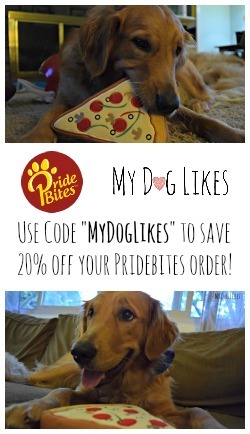 I can really use this for my doxies. I’d LOVE to win this water bowl!! We have 5 rescue dogs and we are CONSTANTLY refilling the water!! Please pick us!!! Thank you ? With 5 dogs, this would be soooo great for your family! Good luck! I love that if refills it’self an keeps the water cool for my pups. I would love to win this for my RedDog. He loves to lounge on the porch and is always getting leaves ,grass and dirt in his dish. This would be perfect – Our boys constantly fill their bowl with dirt too! I love how it flushes the dirt out of the water and the water is always moving and cold. I like that it is self-refilling. Keeping the bowl filled for my dog is not that bif of a deal. But when she has friends over, the water goes a lot faster & I have to remember to keep checking it (or they come & tell me to refill). I like that it is self refilling and BPA free! I like the self filling feature. I have been wanting to try one of these, I have six dogs and think it would be good for them to have fresh clean water all the time. My three rescued Treeing Walker Coonhounds are big drinkers – and sloppy at it, too! I have to keep multiple bowls for them on the back deck and am constantly having to dump and refill them. I love that this bowl fills itself and that it keeps the water fresh and cool. Even in the shade, the water in a regular bowl can get really warm on a hot day. 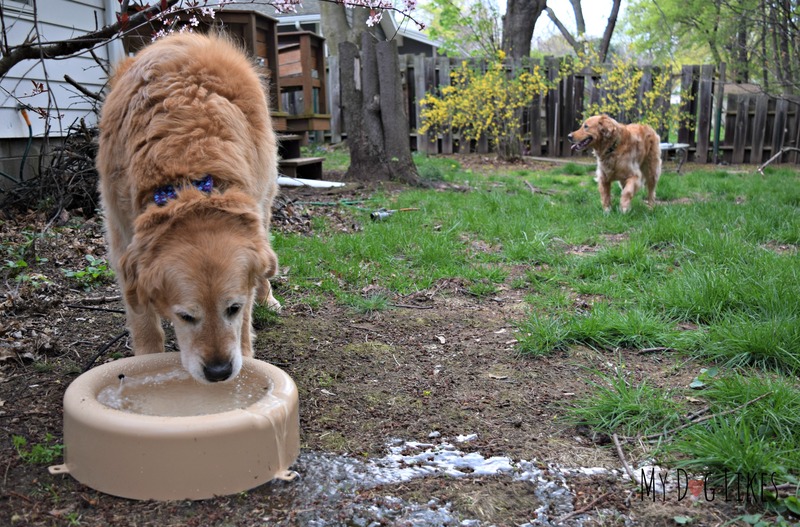 I really love that the Hydro Pet Automatic Dog Water Bowl is USA made! I also love that it has a 1 Gallon Capacity that would be perfect for my 2 thirsty dogs this summer! I love that it continually drains and adds fresh water on its own making sure my babies always have fresh cool water! What a great idea! This will be great for my babies when they are outside playing. I like all of the features that it offer. Thank you for letting me have a chance to wn. I like that it will give my dogs a fresh drink whenever they need it and that it is on an automatic timer. I love that it constantly refreshes the water.Awesome product! I like that it keeps the water cool and also clean! wow, it drains and puts water back in the bowl! A dog slobbers in her water bowl, so continuously refreshing it is a plus. That Phoenix can have fresh cold water anytime he is outdoors running around in the sun. I love that it is set on a timer, such an awesome feature!! I love that the water is fresh and stays cold. My Bailey has a thick, heavy coat and gets really wash in the summer. I love that it automatic. I like how quickly the bowl fills. And, I like there is enough room for multiple dogs to have a drink. I love that it gets rid of the warm and dirty water and replaces it with fresh cool water. I really like that it cycles all the dirty water and junk out of the bowl regularly. I really like that it cycles all the dirty water and yucky junk out of the bowl regularly. 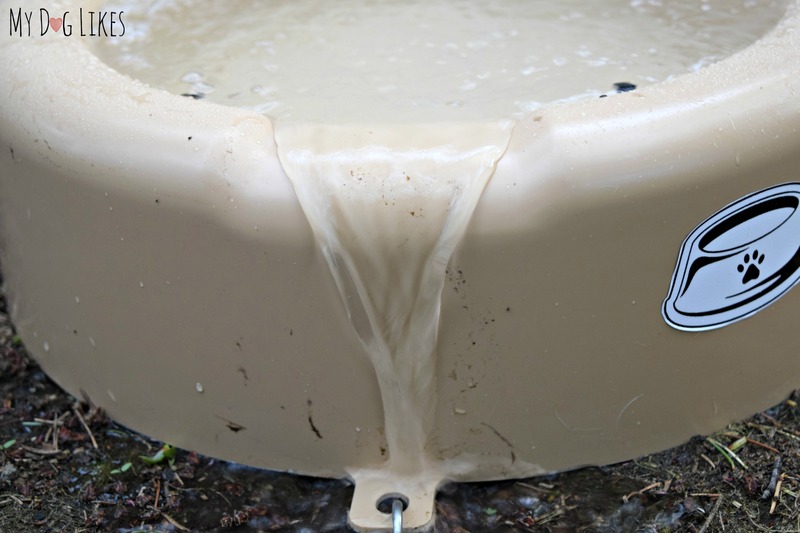 That is one of my favorite features as well, since our boys have a tendency to drag all sorts of gross things into their water bowl when they are outside! I like that both of my pups could drink at the same time. I like that this bowl is basically self cleaning. This is SO COOL! Luke would love that bubbling water. I often empty the dirty water from the dogs’ dishes into some of my flower planters, so having this water plants automatically is just perfect. I like the automatic timer that fills the bowl at preset times. Very nice! My dogs want to win one of these water bowls. Good luck, Michael! I’m sure that they (and you) would love it! What a brilliant idea, I do not have a yard but would if I win for definite donate it to a friend of mine who has a Sanctuary for Senior Disabled Animals as I know she could use it, so we off to enter now, thanks for the give away. I like the self refilling feature. I like that the jets are strong enough to fill the bowl quickly, but were not violent enough to startle our dogs. I like that it keeps the water clean. I like that the water in the bowl is replaced and stays clean. I love that it automatically fills and keeps the water clean! No more worries that they won’t have a drink or that they are drinking dirty, bug water! I like that it uses the dirty water to water plants. I like that it recycles the water for me. Love that it fills with clean water automatically and gives the dirty water to nature so no waste! I like the automatic timer to fill the bowl when I designate the time. It is wonderful that it refills itself. My favorite part is the refill! Never again would I forget to fill my dog’s water bowl! My favorite part is that it gets rid of the warm and/or dirty water before it refills it. I like the multiple installation options. I love that the water refills itself. My favorite feature is the fact that it refills automatically. With 5 dogs, keeping water in the bowls takes a real effort. 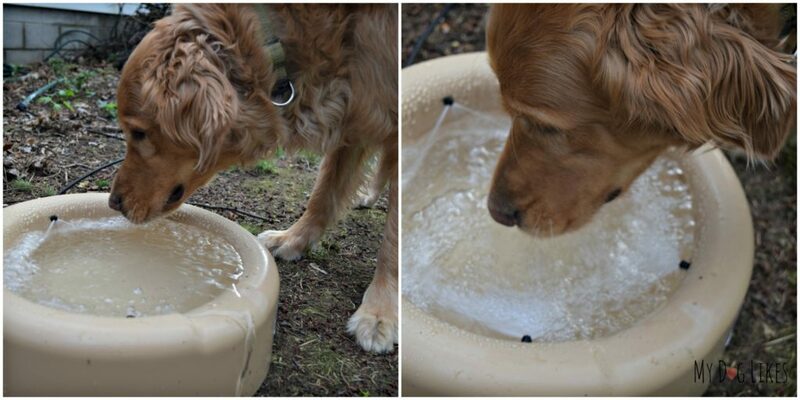 I like that it refills the bowl and that it filters out the old water to ensure the dogs have fresh cool water! like that my pup would always have fresh water. That it keeps refilling itself.. I am impressed with the large water capacity.